In the south-west of Western Australia, many types of beetles are found in pastures, broadacre and horticultural crops. As a first step to knowing whether or not a particular insect is a pest, it is necessary to identify it. The more common and damaging species of beetles are featured here as an aid to their identification. These insects are often found in the same situations and their feeding activity or damage may be confused with each other. Adults of these beetles differ markedly. While adult weevils have a very hard outer shell, are usually flightless and have a prominent snout on the head, the beetles are also 'hard shelled', are more active fliers and do not possess a snout. Further descriptions for each adult species can be seen below. the body forming a C-shape with the end of the abdomen slightly enlarged. the larval stage of the bronzed field beetle are dark brown with upturned spines on the end of the body. a white head, which makes the two black jaws very obvious (this includes whitefringed weevil, small lucerne weevil and Fuller's rose weevil). White headed weevil larva: typical of whitefringed weevil, Fuller's rose weevil and small lucerne weevil. Prominent black jaws, legless. All are soil inhabiting. 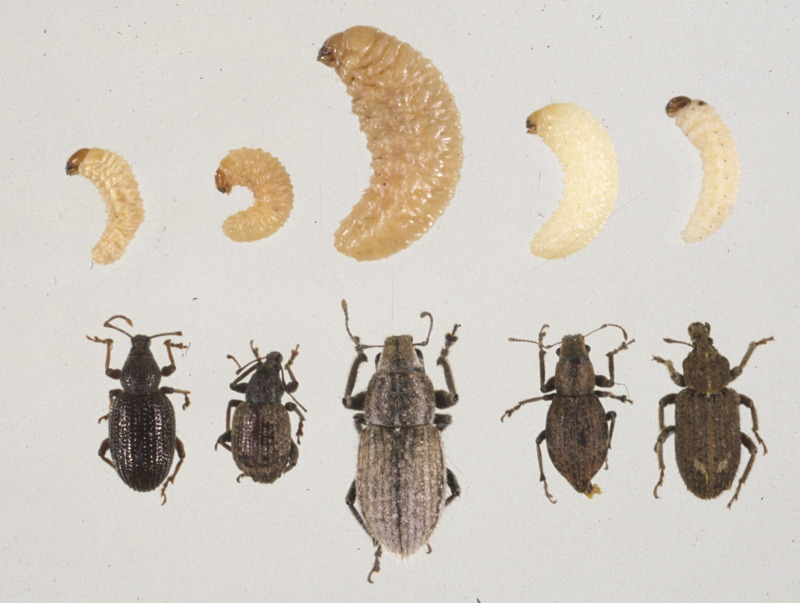 Larvae longer than 10mm are white fringed weevil. Small larvae are difficult to identify. a brown head (this includes garden weevil, apple weevil, spotted vegetable weevil, vegetable weevil, sub-clover weevil and sitona weevil). Brown-headed weevil larvae: typical of garden weevil, apple weevil, spotted vegetable weevil and sitona weevil. Brown head, legless. All are soil inhabiting. Small larvae are difficult to identify.